You recently received an email from a foster parent regarding the status of her foster dog, Jenny, and the shelter’s decision to not place Jenny for adoption. To give you a point of reference, it came to the staff’s attention, approximately 2 weeks ago, that Jenny had 13 separate incidents of aggression towards people, either provoked, or unprovoked, and occasionally made contact with these people. These acts were directed towards people she knew, as well as strangers. The staff had long conversations with both foster parents regarding Jenny, on the phone, and in person, to discuss Jenny, and the surrounding circumstances. 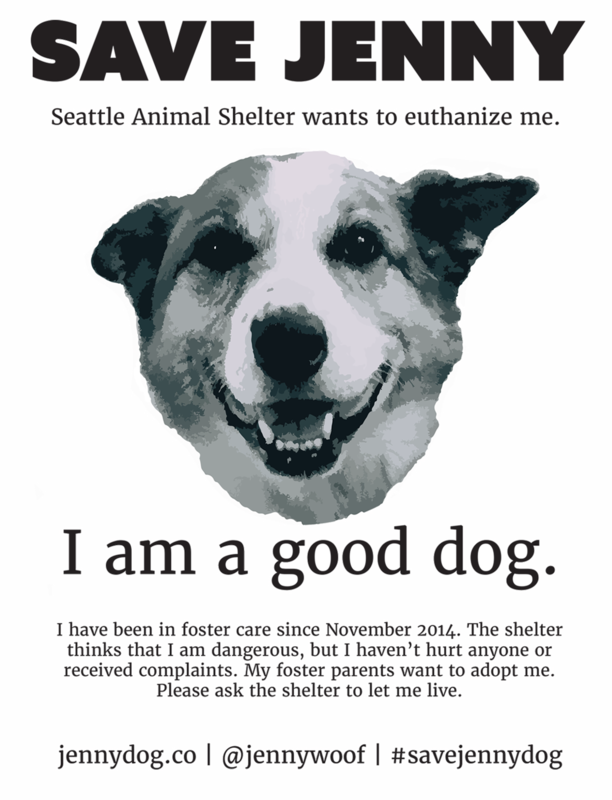 It’s the responsibility of the Seattle Animal Shelter to provide safety to our community, and unfortunately, Jenny is no longer considered a safe adoption candidate. This is never a decision that’s made lightly and without due diligence. *Note: Laura listed wrong email address for Don Jordan. We changed it here from Donald to Don. We have always been completely honest and transparent with you and reported all of Jenny’s behavior. It is untrue that the air snapping incidents (what you call aggression) came to your attention two weeks ago. Jenny’s behavior was documented and shared with you since the day we fostered her. You are able to count the 13 incidents now because we provided you a list of names of those who were air snapped after you made your decision to euthanize. The reason we were so specific was because all, but two, involved our friends, neighbors, and visitors, and a majority of these incidents happened within the first few months and was already known to you. For more details about the two stranger incidents, please visit jennydog.co. We were feeling burnt out and wanted a break from fostering by “the end of July-ish”. Jenny is in pain, it’s making her grumpy, and she needs arthritis medication. Jenny is reactive to some people in uniforms. Jenny air snapped a woman’s skirt. We understand that you want the community of Seattle to be safe, but it a great injustice not to take in account the perspective of the recipients of Jenny’s behavior. These are the people who see her daily and live with her and can see her progress. They are our community. And they are heartbroken that you want to kill Jenny. Before the new information was provided to you, we did not receive a warning or indication from our case managers or any shelter staff that Jenny’s behavior could cause her to be euthanized. Nor did you require us to take her to training. This is unfair to us, to Jenny, and to all the people that love her. If you are a part of Jenny’s community, please leave a comment and let your voice be heard. When I had the opportunity to visit with Jenny’s foster parents at their home, Jenny behaved very typically. She greeted me, sniffed to check me out, and then let me be. Having a rescue dog of my own, her behavior appeared similarly — alert and aware, but quiet and mellow. For the duration of my visit she slept under the table and allowed me to pet her. Jenny is a dog who deserves love, like the kind she is receiving now from her foster parents, and the chance to have a happy life. Continued training and committed parents will provide this. Reconsider your decision. Hi- I am one of the neighbors that live with Jenny. I think she is a sweet dog and she has never been aggressive to me or my dog. Please don’t euthanize her. Let Olli and Amie adopt her! Hi, my name is Mari. I live on the same floor as Jenny. I see her all the time, both in the hallways and at Amie and Olli’s apartment. I can state here that she is not dangerous at all and is safe in public. Sometimes we go hiking together on weekends. Trails are often busy with people and other dogs. No problem. She focuses on her footing and nice smells, notices everyone that comes along, and listens to us when we ask her to wait or come. Even though Jenny is a senior dog, she still learns new tricks. She is very intelligent and loves to use her brain. She especially loves the “Stay” and “Go find it” game. I was so impressed by how quickly she picked it up. Now we play the game all the time. Jenny is a sweet and intuitive girl. One day I visited Amie and Olli’s P-Patch for the first time. I asked Jenny to show me their garden while Amie got gardening tools. Jenny started walking and led me to their P-Patch plot. I wanted to cry. I do not think that Jenny is dangerous. Whatsoever. Everyone in our building agrees. The shelter needs to rethink their decision. My name is Tony. I live next door to Jenny and have known her since Amie and Olli started fostering her. Jenny is not a threat! She is a sweet dog that deserves to live and be taken care of for the rest of her life. I went on an all day hike with my wife, Amie, Olli and Jenny a month ago. On that hike, we encountered many other dogs, and Jenny was the most well behaved there. She has never been aggressive toward me or around me. We met Jenny a couple of weeks ago and found her to be a very calm pleasant dog. She never displayed any aggressive behavior. In the short time we were visiting with her, I taught her a game that is stimulating for older dogs called “go find it!” I hid a piece of apple while I asked her to sit/stay. She responded positively to my request while I hid the piece of apple. Then I told her to go find it! She knew she was learning something new and quickly caught on to the game.Who says old dogs can’t learn new tricks? This gal is super smart and eager to learn! Jenny’s foster parents are right in advocating for Jenny. Their hearts are 110% in the right place. They want to help Jenny by beginning training with professional dog trainers and to give her the opportunity to live a good rest of her life. She deserves that. This sudden decision by the the SAS is distressing to all who know and love Jenny the dog. It is grossly unfair what is happening. As a fellow dog lover, I hope everyone that visits this website will reach out to our city officials and SAS directors to demand they consider a better resolution rather then the one they have chosen for Jenny, which is death. Thank you all for being Jenny’s voice. Dogs deserve better. Jenny deserves to live! I’m one of Amie and Olli’s neighbors and I have a 1.5 year old. We see Jenny all the time and she is always a delight. We have hung out in their home and have never experienced any aggression from Jenny or felt threatened in her presence. Jenny deserves to continue living her improved quality of life that her loving foster parents have given her. Olli, Amie, and Jenny are my neighbors. We all live in the same building. The first time I met her I was picking up some artwork from Olli, that he had photographed for me. I saw Jenny, and was instantly charmed. She just has a sweetness about her. Being charmed, I went in to pet her too quickly, but she was good. After I gave her a pat, I could see that she was a bit guarded, but she just looked up at me. No snipping, snapping, or anything at all aggressive. Another time, she was on the rooftop, just relaxing and eating carrots, while we watered our gardens and visited. She let me pet her a lot and was really enjoying the social atmosphere. That evening on the roof could have been a promotional piece for the Seattle Animal Shelter’s work. Because SAS allowed Amie and Olli (two loving, stable, and dedicated people) to foster parent Jenny, she is becoming more socialized, relaxed, and integrated into the community. Jenny is loved by many. It seems to me that this is the outcome that the shelter would dream of with the animals they place. This makes the threat of euthanasia for Jenny all the more shocking. It just does not fit the true picture of Jenny’s life. Let Jenny Live! I am a neighbor of Jenny and her family, Amie and Olli. Jenny is a beautiful dog, and I have never had a bad encounter with her. Amie and Olli are exceptional in their care for Jenny. They are very respectful of neighbors when walking Jenny, and inform newcomers to go slow with Jenny. This is not an unreasonable request, and makes everyone more comfortable. Jenny has a wonderful home with Amie and Olli, I sincerely hope you reconsider euthanizing her, it would be a travesty of justice. I live in the apartment next door to Jenny and her foster parents, Amie and Olli. I’ve had regular contact with Jenny since she was adopted last November. I’ve never once felt that my safety was threatened and would definitely not consider Jenny to be a dangerous animal. She allows me to pet her and behaves normally in my presence. I’ve encountered dogs on the street that were aggressive and threatening, but Jenny doesn’t fit into that category and when it was brought to my attention that SAS had decided to euthanize her, I was shocked. I believe that SAS’s sudden & unexpected decision to euthanize Jenny is excessive and totally unnecessary. I dont see what good could possibly come by killing an innocent animal that 1) has not harmed anyone 2) to my knowledge no evidence exists that would indicate she might harm anyone 3) she is under the care of foster parents who have voluntarily taken her into their care, invested considerable time & energy into her care, and are committed not only to continuing her care but also to actively pursuing her rehabilitation. Furthermore, if SAS decides to ignore the growing protests of family, friends and community members who have quickly rallied around Jenny, I think they risk undermining public support and trust, not to mention their own credibility as an organization. In other words, euthanizing Jenny seems to be a losing proposition for everyone involved and I strongly encourage SAS to reconsider. =I’m neighbors with Olli and Amie living on the floor below. I’ve met Jenny before and she seems like the sweetest dog, very friendly to me on the very first time we met. I would strongly suggest you change your decision to kill Jenny on the basis that she deserves to live and continue to be happy. You have the community she has been living with coming together to tell you the same thing, that she hasn’t harmed anyone and that they love Jenny. I urge the SAS to focus on love and compassion, save life and give Jenny another chance. I am writing to share my concern with you over the mistake of unnecessarily ending the life of a special and worthy dog that has crossed paths with your shelter. I understand that hundreds of tough decisions have to be made monthly by your organization and commend you on all that you do to give animals a second chance at a happy life. I wanted to share my personal experience with Jenny and her foster parents, in hopes that the decision to uthenize her would be reconsidered. I brought my 11 year old daughter to Jenny’s home for a photo shoot and was immediately taken back and touched by the gentle patience and understanding that Amie and Olli had for Jenny and her well being. Their priority was to make sure Jenny was understood and comfortable so that she could continue the healing process (which is what a perfect foster parent should do) I saw that Jenny was indeed shy but was already bonded and looked to her parents for guidance and encouragement. She warmed up quickly to my daughter (11) and I, politely sat through a photo shoot that was going on, and soon enough was comfortable enough to play, eat treats, and just be herself:) we have crossed paths with her while out on daily walks and have been touched by the unconditional love and growth that we have witnessed each time over the past few months. Please reconsider and have faith in this family. I was first introduced to Jenny when my sister and brother-in-law, Amie and Olli, volunteered themselves as foster parents to her late last year. It was obvious to anyone that has spent time with her that she had been through a lot of trauma and was in need of a lot of TLC. Although she was visibly apprehensive, probably scared, of people she was never aggressive or menacing in anyway. In fact, it just seemed like she was in pain or distrustful of humans. She had unexplained wounds on her body. All the signs pointed to neglect or abuse by previous owners. I spent hours in Amie and Olli’s cozy apartment with Jenny, getting to know her. At times she would let me pet her, other times she would be less friendly. I touched her paw at one point and she pulled it back and snapped at me, her teeth grazed my hand. My immediate reaction was that she was hurt and letting me know. Not once was I scared or intimidated by this action. If Jenny could talk, she probably would have said, “Ouch, I am hurting. Help me.” Turns out that Jenny has arthritis and needed medication, which Amie and Olli have now provided her. Anyone that has taken the time to engage with Jenny over these past few months can tell you that she has made great strides in her social interaction. I thought this was the point of rescuing these animals and being humane towards them: to prevent them from further mistreatment and give them good lives when possible. We all understand the important need to keep the public safe, but Jenny has not been and is not a threat to the community. Her circumstance and the progress that she has made should lead to the complete opposite conclusion of euthanasia. We all know the SAS has a great reputation and tries to be compassionate and humane — but this time, information given in good faith to help you understand Jenny (to help her) has been misconstrued. The conclusion that you have arrived at is completely wrong and now Jenny’s life is in the balance. There are options for Jenny right now, many options that do not have to be either death to Jenny or liability to the city, if that is what the concern is. Please understand that you have many citizens, supporters, and constituents watching and waiting for you to not just do the decent thing, but the right thing. I have daily constant interaction with this dog and her family. Amie and Olli are always in control. There is no question that Jenny is safe to be around. I think we all need her in our building. My name is Jon Perry and I am a friend, and neighbor, of Jenny and her wonderful family. I see and interact with Jenny on a daily basis and I have never witnessed any signs of aggression. As a lover of animals and a former professional dog walker, Jenny is very well taken care of, she is in a safe environment, and we love her. She is part of our new and amazing family in Mount Baker and a wonderful addition to our thriving community. Please do not kill Jenny. This is her home and she needs to be here with us. Thank you for your time. Please feel free to contact me directly, as I am happy to discuss this matter. Hi. I’m Hazel and I think that Jenny is a good dog. I’m not scared of dangerous animals, but I think that I would be able to tell if Jenny was one. I also think that even though Jenny can be a little bit shy sometimes, she has never done bad anything to me. I think that if Amie and Olli thought that she was dangerous, that wouldn’t foster her. I just want to write a couple of things that I didn’t have time to write about jenny earlier. My good friend Azure loves dogs and even though she hasn’t met jenny yet, she already knows she is a great dog. I really like jenny and I think that all the other dog lovers do, too. Also, I feel very safe and I am only 9 years old. Hello everybody! Thank you all for your support and interest in Jenny. If you no longer see your comment, it has been moved to this page. We want third-person observations of Jenny’s behavior grouped together during this evaluation period. If you have not met Jenny and want to comment, please go to here. If you have met Jenny, you’re in the right place! Please leave your comment below.